I know some writers like to say that having a book release is like giving birth. Well, as a writer, I am here to tell you, that is a complete fabrication. Sure, a book release is exciting, the culmination of careful planning, confidence building and relatively painless. Everything giving birth is not. And while it may bear no resemblance to the birthing process, it does feel an awful lot like the next stage–parenthood. Like children, each book is special in its own unique way, disappointing in others. They need attention and nurturing to grow and thrive, left alone, they may wither. I am proud when random strangers (i.e. reviewers, librarians, teachers, readers) comment on their intellect and beauty, but offended when they do not receive the praise I feel they deserve. And, of course, when I scrutinize their pages, I will inevitably wish there was something I had done differently. But aren’t the most dynamic families made up of the most imperfections? The preachy grandma, the boring uncle, the whiny cousin…I am grateful for my family of books that chart my imperfections as well as my growth as a writer. And, like any hopeful parent, I always pray that each one goes out into the world and makes a difference. One night last week, when the lantern was out and the cabin was cool, Mama told me about a place we could go to learn letters. 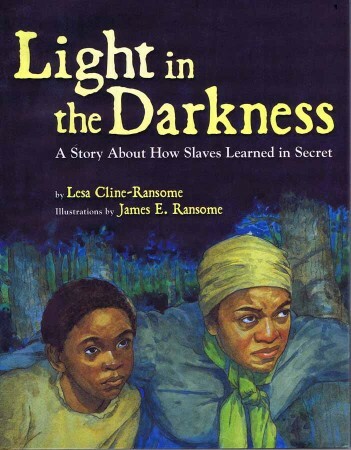 Today is the release of my newest title, Light in the Darkness: A Story About How Slaves Learned in Secret (Disney, Jump at the Sun). While combing through research for my Frederick Douglass picture book biography, I stumbled on a small passage about Pit Schools, holes dug in the ground where slaves would gather at night to learn to read from another literate slave. Through the eyes of young Rosa, we see her and her mother risk their lives to learn one letter at a time. Master will whip us all, and Morris the most for teaching us. A lash for each letter. Their desire to read and persevere in the face of fear is a celebration of the many African Americans who sought the light of education during the darkness of slavery. Image | This entry was posted in Uncategorized and tagged childbirth, Family, lesa cline-ransome, parenthood, publication, Writing. Bookmark the permalink.